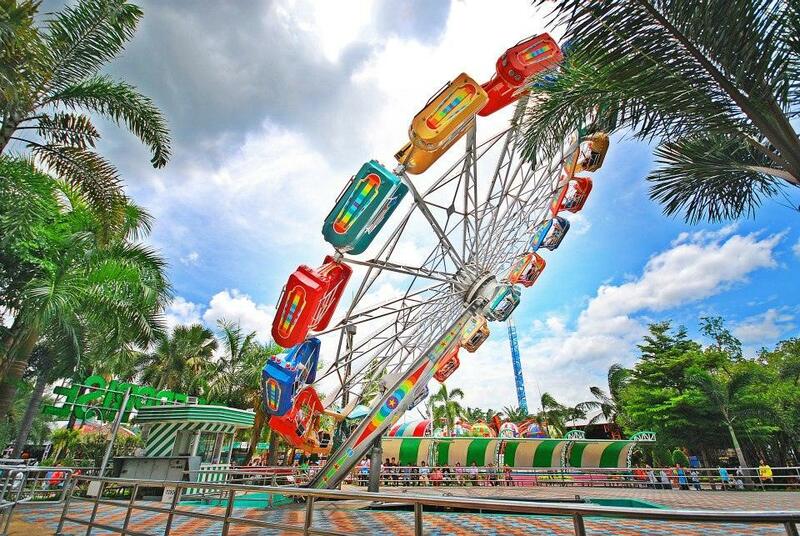 Siam Park City is Bangkok’s largest amusement and water park. 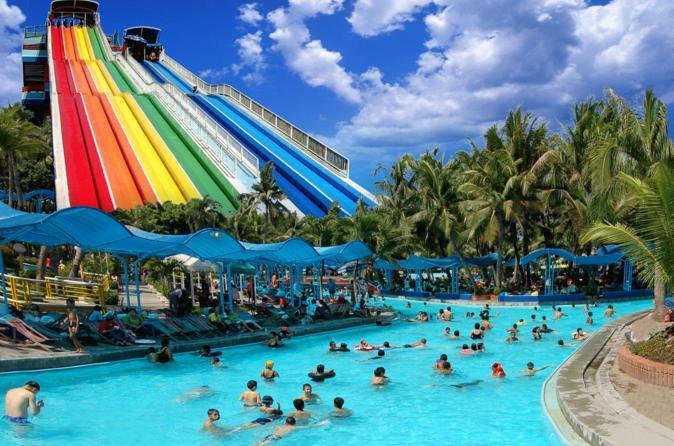 Spread out over a large area are the world’s biggest wave pool with several large water slides, dozens of rides including roller coasters and attractions like Africa Adventure and Jurassic Adventure. The thrill rides of the Amusement Park, the relaxation at the Water Park’s pools and the pool side Thai massages provide for a fun day for adults and kids of all ages. A whole day is easily spent here. 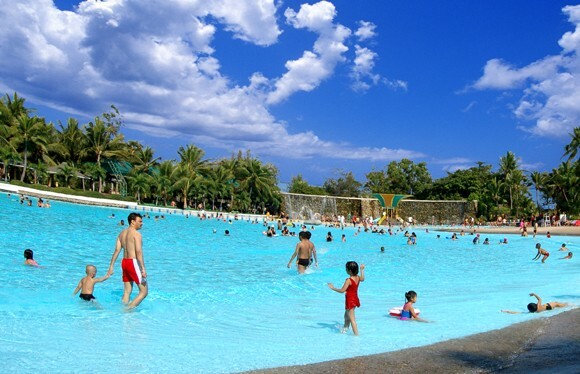 There are plenty of places with shade both in the water park and the amusement park. Food is available at several restaurants and countless food stands around the park. After dark the park is beautifully illuminated. Water Park Known as “The sea of Bangkok”, the water park houses the world’s biggest wave pool as recorded in the Guinness Book of World Records. The very large pool with small waves creates the illusion of being at a beach in Bangkok city. Smaller pools are the flowing pool and shallow ones for the smallest children. Life guards are on duty around the water park. Pool size Thai massage and foot massage is available at 300 Baht per hour. Water Park Slides Impressive slides are the 23 meter high Speed Slide at the flowing pool and the Super Spiral spiralling down several levels into one of the smaller pools. Ending in a shallow pool is the Mini Slide for small kids. Swim wear and towels are for rent if you don’t bring your own, beach chairs are 10 Baht for the whole day. Personal belongings can be stored in lockers (20 Baht) next to the changing rooms and showers. Next to the water park entrance is Si-Am Marine restaurant. 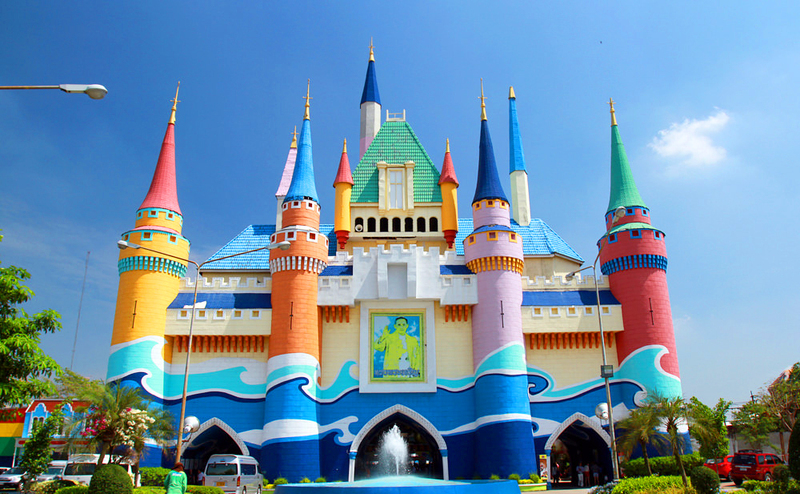 Amusement Park For an adrenaline rush and some serious thrills, head to the amusement park of Siam Park City. 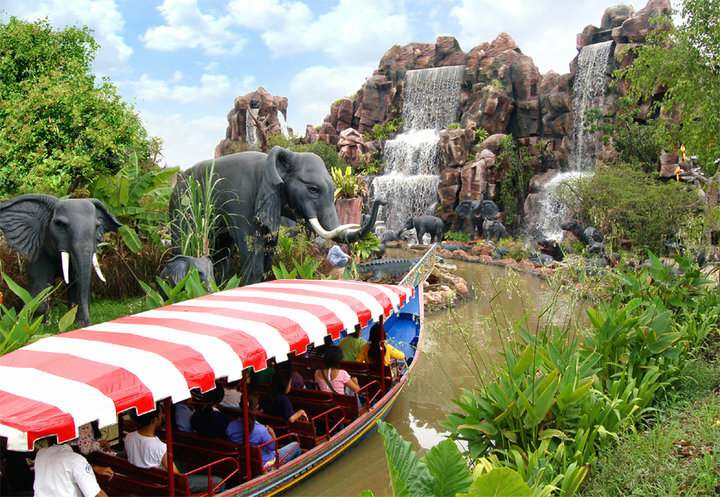 The park houses about 30 rides including spinning rides, roller coasters, drop tower, gyro tower, log flume and swing boat. You can get on each ride an unlimited number of times. As Siam Park City has been around for a while, some rides are closed for maintenance every now and then. The amusement park is made up of four zones. X-zone, the most extreme rides The X-zone houses the most extreme rides such as the Vortex and the Boomerang. To get on the X-zone rides your height must be over 130 centimeters. With a length of over 750 meters the five loops Vortex is one of the largest suspended looping coasters. 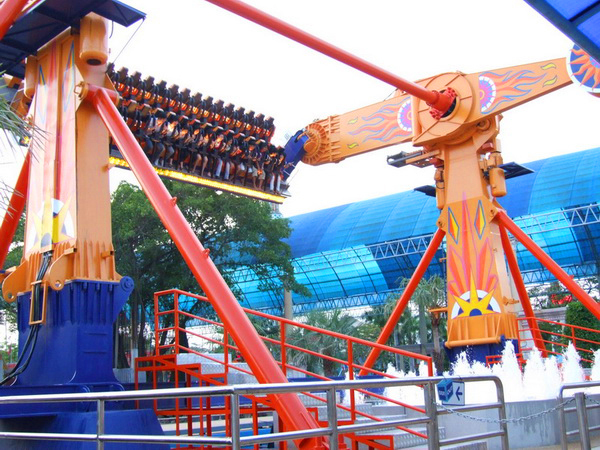 The Boomerang, a roller coaster with three loops will have you racing forward and backward. 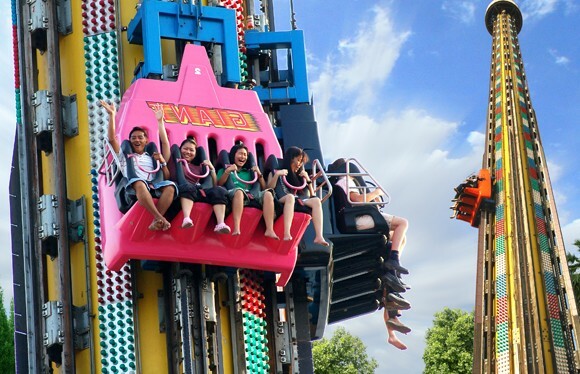 The Giant Drop is a free fall ride from a height of 75 meters, the highest in South East Asia. Spin around going up to 24 meters above the ground in the Balloon Race. The Condor will have you circling and spinning through the air, while the Topspin swings back and forth and upside down at varying speeds. Fantasy World, the easier rides Fantasy World has the easier rides suitable for smaller kids except for the smallest ones. Twin Dragon will have you swinging back and forth in a Viking ship with a dragon on the bow. Bounce and spin around like crazy on the giant plate of the Tagada Disco. Other rides in this zone are the Astrofighter, Trabant, Monster and Rock & Roll. Family World, attractions for the family At Family World you will find attractions suitable for everyone in the family. Africa Adventure Drive through the African landscape on a small open train and see villages and mechanical African animals as lions, elephants and giraffes moving around, listening to scary sounds coming from the jungle. A giant King Kong has captured a man. Dinotopia Feel like in Jurassic Park. Walk through the darkness while suddenly a spotlight lights up moving giant dinosaurs and prehistoric men. The adjoining museum houses several dinosaur skeletons and provides information about the animals. Jurassic Adventure Get driven through a jurassic landscape in a Jeep and see many species of dinosaurs moving around and making scary sounds and see an exploding volcano. Big Double Shock Get some serious scares at the Big Double Shock, a haunted house with lots of scary encounters. Si-Am tower The Si-Am tower brings you up to 100 meters where you will have 360 degree panoramic views of the area. The highest in South East Asia. Grand Canyon Express An elevated ride over a Grand Canyon like landscape. Log Flume A long water slide down from the mouth of a giant lion. 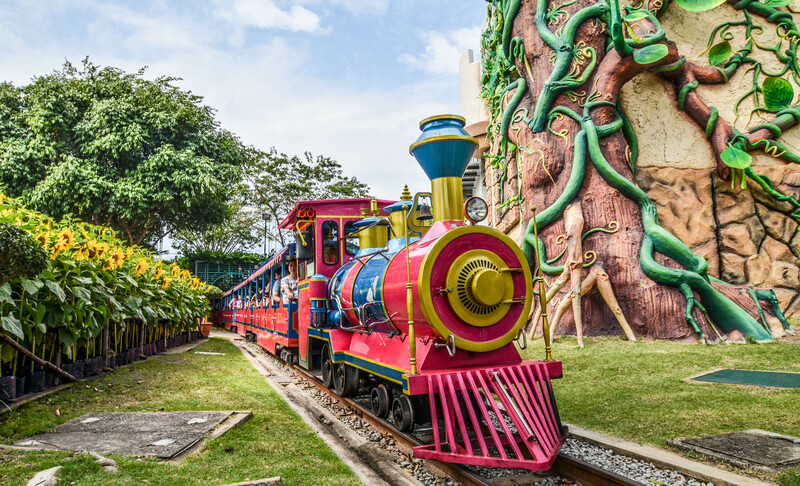 Small World, for the youngest children Rides and fun for the youngest kids. 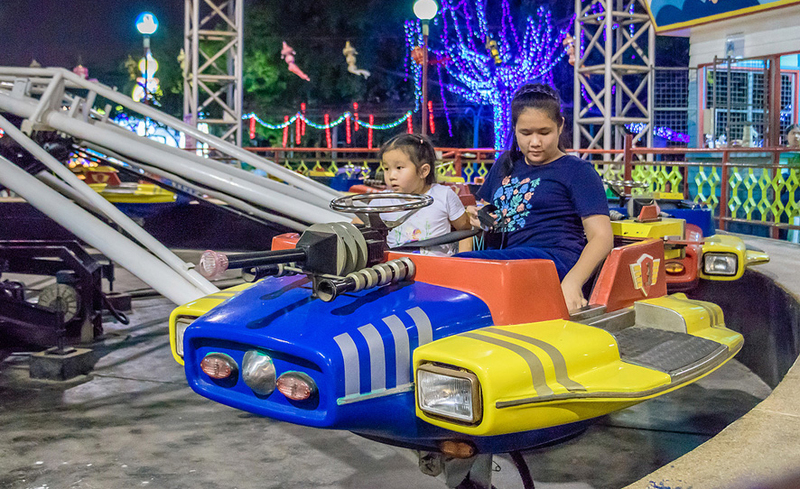 Among the rides here are Mini Carousel, Mini Motorcycle, Swan, Mini Boat, Play Port, Mini Astrofighter, Double Deck Merry-Go-Round. Food and drinks Around the park are several restaurants and countless stalls selling food, drinks, snacks and ice cream. The buffet lunch that is included with the entrance ticket is a good variety of Thai, Indian and European food like rice dishes, soup and pasta, as well as local fruits and desserts. Soft drinks like Coke and Sprite included. 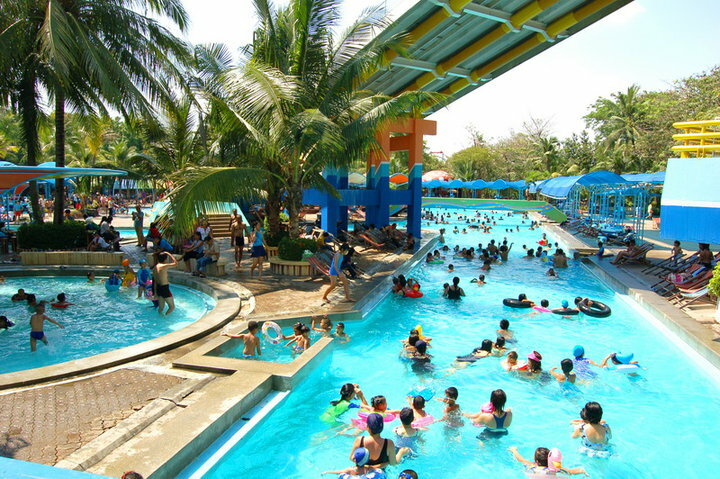 Location and how to get there Siam Park City water and amusement park is located at 203 Suan Sayam road, Khannayao district, Bangkok. The easiest and quickest way to get there is by taxi. From downtown the ride will take between 45 minutes to 1½ hours depending on traffic. Make sure the driver switches on the meter. Opening hours Siam Park City opens daily. The water park from 10 am until 5 pm, the amusement park from 10 am until 6 pm. Buffet lunch starts at 11.30 am until 2.30 pm. Best time to visit is on a weekday. On weekends and Thai national holidays the park can get busy. For children under 90 cm. will be Free of charge. For children under 135 cm. we charge 70% of the price that calculate from a total number of adult pax. For children over 135 cm. we charge normal price.